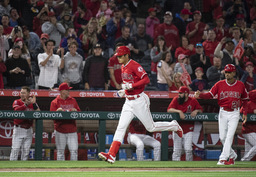 Rookie sensation Shohei Ohtani is making himself at home in the Big A.
Ohtani hit a home run for the third straight game and the Los Angeles Angels rallied from an early six-run deficit to beat the Oakland Athletics 13-9 on Friday night. The two-way star from Japan connected for a long, solo drive in the second inning against Daniel Gossett. The ball landed in the rocks beyond the center field wall after traveling 449 feet and was measured with a 112.3 mph exit velocity according to Statcast, the hardest-hit and longest of Ohtani's three major league homers. "Smoked that ball, huh?" Angels shortstop Andrelton Simmons said. "The center fielder ran after it like he had a chance for a second, scared everybody. Wasn't even close." Ohtani, who is batting .462 (6 for 13) at home, drew a walk on four pitches with the bases loaded to pull the Angels within 8-7 in the fifth. All seven of his RBIs through his first four games have come in home games. "It's very impressive, yeah. You don't see too many guys do that on the mound and at the plate. Any," Athletics manager Bob Melvin said. Ohtani is scheduled to pitch Sunday - the 23-year-old won his first big league start last weekend against the A's. Angels manager Mike Scioscia does not plan to use Ohtani as the designated hitter on Saturday and have him get a chance to extend his homer streak. But Scioscia said he would be open to letting Ohtani hit before or after a start later this season. 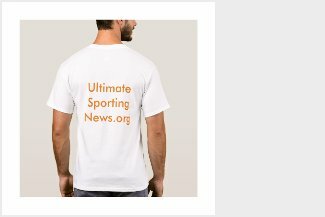 "There has to be point where he becomes a pitcher, not to say sometime during the season he won't be available to do a little bit more the day before he pitches or a day after. But certainly right now we're going to err on the side of caution," Scioscia said. The Angels trailed 6-0 in the second. Boosted by five home runs, the A's still led 9-7 in the seventh before third baseman Matt Chapman's throwing error on a grounder by Zack Cozart allowed two runs. Justin Upton then broke the tie with a three-run homer. "You got to really, really try to keep this lineup quiet," Simmons said. "You just give us any room, we can bounce back. We kept coming at them, kept putting good at-bats and kept threatening them and putting pressure. They made a mistake to tie the game, and then Upton got the big hit after that. The lineup really shows how deep it is." Jim Johnson (1-0) got the win as the Angels took their third in a row and won for the sixth time in seven games. Simmons and Luis Valbuena each had two RBIs. Matt Joyce and Marcus Semien hit back-to-back homers as part of a five-run second inning, and the Athletics sent Parker Bridwell to the dugout after 1 2/3 innings. Joyce's two-run shot to right was his first of the season, and Semien followed it up with a solo homer to center for his first to put the Athletics ahead 6-0. The Athletics also hit consecutive home runs against the Angels in the season opener on March 29. Chapman had a two-run homer in the fifth, and Matt Olson added a solo shot in the seventh. Jed Lowrie hit a solo home run in the first - he singled with two outs in the ninth, but was caught taking a wide turn around first for the final out. "When they came back on us, we swung the bat well again and got a little more distance," Melvin said. "Just couldn't hold it." Blake Treinen (0-1) took the loss. Athletics: OF Trayce Thompson will join the team on Saturday. The younger brother of Golden State Warriors guard Klay Thompson was claimed off waivers from the Yankees on Thursday. Angels: LHP Andrew Heaney (elbow inflammation) gave up one run and two hits while striking out six in 6 1/3 innings in a rehab assignment at Single-A Inland Empire. Ohtani is the first American League player with a home run and at least two RBIs in each of his first three home games since RBIs became an official statistic in 1920, according to STATS. Babe Ruth was the last American League player prior to Ohtani to homer in three straight games in the same season he started a game as a pitcher. Ruth did it five times, starting in four consecutive season from 1918-21 and again in 1930. Gossett was pulled after five runs in 3 1/3 innings. He gave up five hits and one walk while striking out three. Bridwell finds himself with an ERA of 32.40 after giving up six runs and seven hits. Athletics: RHP Andrew Triggs (0-0, 1.80) was not involved in the decision in his first start of the season, allowing one run and four hits in five innings at Texas on Monday. Angels: RHP JC Ramirez (0-1, 7.71) allowed four earned runs in 4 2/3 innings against Cleveland on Monday.